CEO Powercast features an in-depth interview with Daniel Mumby, a rock star LinkedIn mega-contributor with more than 37K followers and international expert in helping companies raise expansion money. His success secrets round out a jammed packed episode dedicated to helping businesses get to the next level using out of the box strategies that won’t break the bank. The second episode (download here) of CEO Powercast hosted by CelebExperts CEO Evan Morgenstein and Synergixx CEO Charlie Fusco covers a variety of topics this week including Evan and Charlie’s recap of Expo West, secrets to tripling your LinkedIn results, new ways to compete in retail and how any company can afford a celebrity endorsement. In addition, the duo will interview StartUp Foundation CEO & Founder Daniel Mumby who spoke at length about the challenges he has faced as an entrepreneur. Affectionately known as “That Startup Guy”, Daniel invests his time and expertise to further the entrepreneurial community as an investor, mentor and motivational keynote speaker. He draws on his experiences as an intrapreneur in the corporate sector and his own successful career as an entrepreneur to help other entrepreneurs navigate the startup process and avoid common mistakes. 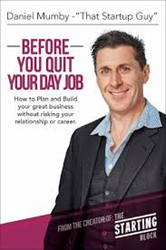 Mumby recently published his own startup guide titled, Before You Quite Your Day Job. In it he describes how anyone can plan for and build a successful startup business without jeopardizing their professional career or personal life outside of the office. The book is targeted at experienced professionals who have found success in their current roles but are looking for expert advice in bringing their own great startup ideas to life. Episode 2 of the CEO Powercast podcast with Evan Morgenstein and Charlie Fusco is available now at http://www.ceopowercast.podbean.com. Each podcast episode is also available via iTunes and LinkedIn. For more information on the podcast and future guests of the show, visit http://www.ceopowercast.com. CelebExperts is a leading consulting firm dedicated to demystifying the celebrity acquisition process and finding creative solutions to effectively market your brand, leveraging the power of a celebrity. For more information on how your brand could utilize a celebrity talent as a spokesperson for upcoming marketing campaigns, please contact our team at consulting(at)celebexperts(dot)com or give us a call at (919) 459-5426. Synergixx, LLC is a creative think tank leading the way in merging traditional and online direct to consumer health and lifestyle product and service marketing strategies on TV, radio, print and online. The firm handles all media buying internally, and has an in-house, 24-7 sales and customer service call center for immediate fulfillment when clients’ products or services are advertised. For more information, visit http://www.synergixx.com or call 1-800-610-1771.